Matthew and I had a great time at 2019 Winter NAMM and had a change to do some video of the Gibson NAMM booth. We checked out the guitars and had a chance to talk with the new Gibson CEO James Curleigh. At NAMM 2019 we had a chance to demo the new Jimmy Page Signature Sundragon amp and Fender Jimmy Page Mirrored and Dragon Telecasters. We talked to the maker of the Jimmy Page Sundragon amp, Mitch Colby. Mitch explains the details of the Sundragon amp and how it duplicates the modified Supro Coronado that Jimmy Page used in the studio for Led Zeppelin I. We also had a chance to try out the new Jimmy Page Mirror and Dragon Signature Telecasters at the Fender booth. Watch the video for all of the details. Ask ThroBak Thursday Episode #5. We talk about counterfeit ThroBak pickups as well as others that you should look out for on Reverb and Ebay. We also play and talk guitars that include a 1967 Gibson ES-330 and a 1965 Epiphone Newport bass. Thanks for watching and please click subscribe. The new executive team takes charge at Gibson this month and they claim to all be musicians. But can they play any better the previous CEO did? Jimmy Page Signature Fender Telecaster Announced! Fender just announced a new Jimmy Page Signature Telecaster that will be unveiled at 2019 winter NAMM. The new guitar will be available in a limited run or 100 signed guitar as well as a more affordable production run. Watch the video to learn more. Billy Gibbons is widely recognized as the king of electric guitar tone. I like many others consider his playing and tone to be the benchmark of Blues/Rock tone and technique. Matthew and I were eager hear the new Billy Gibbons Album, Big Bad Blues and we decided to video our first listen in the ThroBak Guitar Lounge. So what is wax potting and what does it have to do with a PAF guitar pickup? Wax potting is process now commonly used to eliminate feedback through the pickup by saturating the entire pickup assembly with molten wax. Although common today, wax potted was never used by Gibson when making guitar pickups in the 1950's and 1960's. The question is, does this no wax vintage specification have an impact on the feel and tone of a P.A.F. pickup? In this video I explore that question with an A/B shootout between a P.A.F. repro with no wax vs. the same pickup wax potted. ThroBak Pickup Giveaway winner Chosen! 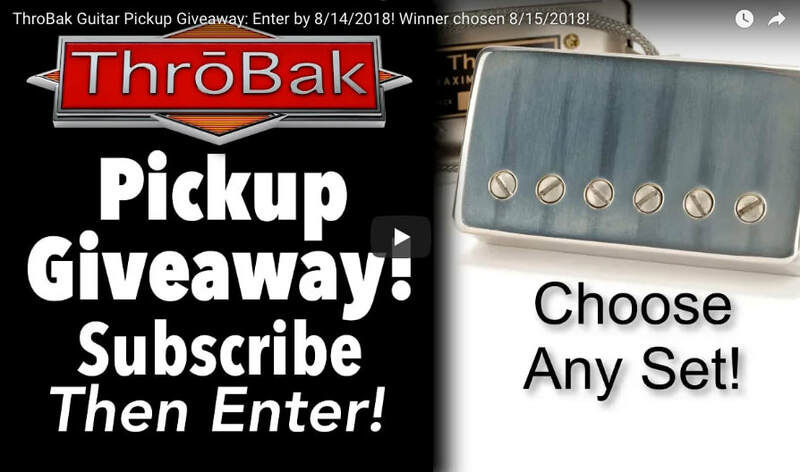 Congratulations to Frank Kissane of Germantown, WI for winning the ThroBak Guitar Lounge YouTube Subscriber giveaway! Frank chose a set of shiny KZ-115 P.A.F. repro pickups for his prize. Thanks to all ThroBak Guitar Lounge subscribers that entered the giveaway. In the future I will probably do another giveaway to mark another ThroBak milestone. In total there were 951 entries. The winner was chosen at random via the google random number chooser. Frank's winning entry was number 404.